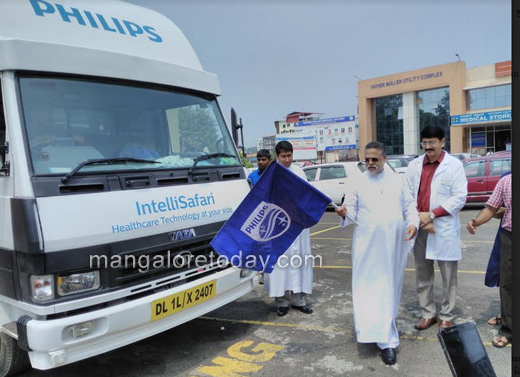 Mangaluru,Oct 10,2017: Philips India, a leading healthcare technology promoter, unveiled ’IntelliSafari’ in Mangaluru. Featuring a specially designed Mobile Van the ’IntelliSafari’ is an intensive awareness campaign through which Philips will reach out to hospitals, nursing homes and clinics in Tier 2 and 3 cities in India and familiarize them with the latest technological advancements in healthcare, available at a low cost. Recognizing the need of healthcare solutions for patients, the program is designed to meet the customers across cities and visit them with Philips products and solutions. It was flagged off at the city’s historical 137 year old hospital, now a super specialty center in the city. The special Van then moved around various hospitals. The special vehicle showcasing state-of- the-art technologies from. 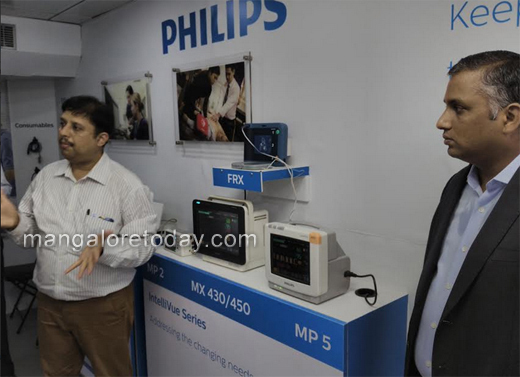 Philips Healthcare, will travel across key cities in Karnataka. This ‘hospital on wheels’ is a showcase of affordable high-end patient monitoring and critical care equipment. The mobile van is equipped with advanced cutting-edge products, designed to treat patients ranging from adults to neonates in ICU, CCU, as well as general wards and nursing care units. Intensive Care Unit – Patient monitors (various categories and acuity levels based up on every need of critical outcome and budget), ** Portable patient monitoring solutions Networking Cardiographs (ECG machines) – Portable and table top models with interpretation Fetal and maternal monitors Defibrillators and AED devices Portable Ventilator and BIPAP devices Hospitals and clinics challenged by their environment, financial circumstances, or patient demographics can select healthcare solutions that meet Philip’s standards and an essential health consideration for wellness. Note : Imaging informatics, also known as radiology informatics or medical imaging informatics, is a subspecialty of biomedical informatics that aims to improve the efficiency, accuracy, usability and reliability of medical imaging services within the healthcare enterprise. It is devoted to the study of how information about and contained within medical images is retrieved, analyzed, enhanced, and exchanged throughout the medical enterprise. As radiology is an inherently data-intensive and technology-driven specialty of medicine, radiologists have become leaders in Imaging Informatics. However, with the proliferation of digitized images across the practice of medicine to include fields such as cardiology, ophthalmology, dermatology, surgery, gastroenterology, obstetrics, gynecology and pathology, the advances in Imaging Informatics are also being tested and applied in other areas of medicine. Various industry players and vendors involved with medical imaging, along with IT experts and other biomedical informatics professionals, are contributing and getting involved in this expanding field. Imaging informatics exists at the intersection of several broad fields. The technology will be more helpful at time of accidents , where in many cases the victim breathed the last on the way. The technology is advance but the doctors have commercial thinking and they only care about getting back the amount invested . if you genuinely treat the patients its a good initiative.